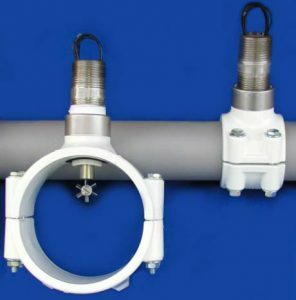 The Saddle Turbine Series of Insertion Flowmeters are designed for measuring liquid flow in 2″, 3″ and 4″ diameter pipes with accuracies inherent in the flowmeter at a substantially lower price than in-line flowmeters. Designed for installation in metal, composite or plastic piping, the Saddle Series is an economical alternative to full-bore, in-line flow liquid flowmeters while providing good measurement performance in a rugged package. The rotor and signal housing is interchangeable for 2″, 3″ and 4″ sizes in order to maximize its flexibility and requires only a change in the saddle fixture to change from one size to the next. The use of 316 stainless steel for the housing insert, 17-4 pH for the rotor, hard carbon composite sleeve bearings and PVC installation saddles also enable the meter to be used in a variety of liquid services. Wide flow turndown ranges for liquids. Linearity +/-2% of reading or better. Insertion meter for pipe sizes 2″, 3″ and 4″. 3-Point one centistoke calibration at minimum, mid-range and maximum linear or extended range. BEARING TYPE: Hard Carbon Composite Sleeve Bearings. MATERIALS: Housing insert and rotor support Are 316 stainless steel. Rotor – 17.4 stainless steel (standard). Saddle is PVC. OUPUT SIGNAL: Output level – 10 mV RMS minimum. MAGNETIC COIL: Wave shape – sinusoidal. DC resistance of sense coil – 2000 OHMS. Coil – magnetic pickup type. M-L 3/8X1.52 with flying leads.